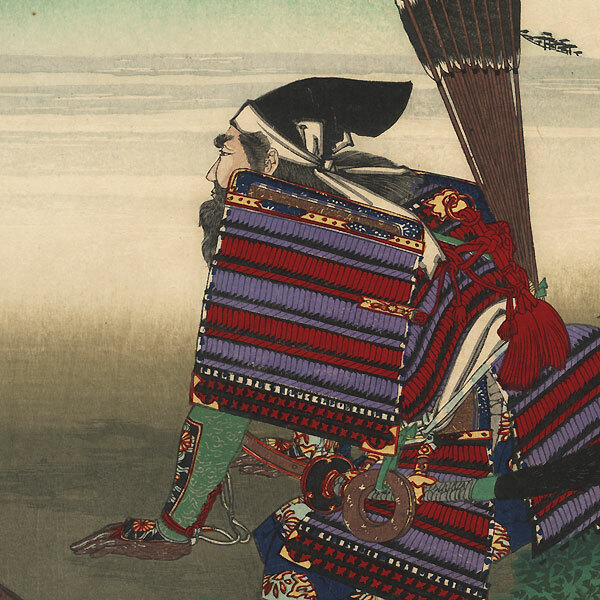 Comments - Interesting scene of the great warrior Kusunoki Masashige watching as the Emperor's procession approaches in the distance, the ruler riding in an elegant enclosed palanquin topped with a phoenix figurine. Kusunoki was a brilliant strategist and general who fought to restore the exiled Emperor Go-Daigo to the throne. At the great Battle of Minatogawa, he led his men into the field on the emperor's order, knowing that his side faced superior forces and almost certain death. Badly defeated, Kusunoki and his remaining men committed ritual suicide. Kusunoki is remembered for his extreme loyalty and self-sacrifice, and a monument to him stands outside the Imperial Palace. Here, the general in the center kneels respectfully, keeping a close eye on the group as it passes through a valley at upper left. He wears a fine suit of armor and a black court cap, a quiver of arrows at his side. 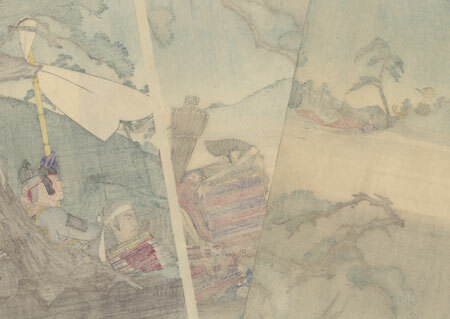 Other samurai sit beneath a pine tree at right, one holding a white banner that flutters in the breeze. A striking design with a lovely landscape setting, beautifully colored and composed, detailed with burnishing on the black caps and the armor. The image appears as if inside a scroll that is unrolled. The first time we've seen this handsome subject. Condition - This print with excellent color and detail as shown. Three separate panels. A few small spots. Please see photos for details. Nice overall.